One of my favourite pieces of art equipment is my Jakar Battery Operated Eraser Pen. In fact I'd go as far as saying this is an essential piece of kit for me. I know I can't stop myself from stockpiling reserves against the awful day when it finally disappears from view. I'm always surprised by the number of experienced artists who've never come across a battery powered eraser before. I'm forever handing out details of how to get hold of this one - after people have seen what it can do. Until time comes to replace the first eraser. Then you begin to detect the virtues and vices of various different models rather quickly. I won't mention the ones which I have found to be frustrating beyond belief! Rather, I will introduce you to my dirt cheap super light Jakar Battery Operated Eraser Pen. The huge advantage of this eraser pen is its light weight due to its plastic body. The only real weight comes from the two AAA batteries. This makes it very easy to use as a pen as its name suggests. I find that I use it more and more like a rather fat pencil which erases rather than making a mark. 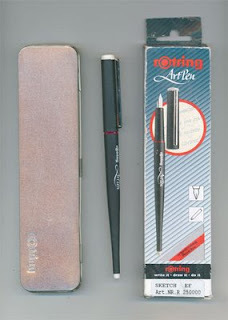 Used slowly, it removes all trace of graphite and coloured pencil very cleanly without abrading the paper. Used quickly and lightly - in a stroking or dabbing action - it can lighten without removing all colour. If you you then work back over the erased area it's possible to create a complex texture of optical colours. A lot of my artwork employs this technique and the Jakar eraser pen is an essential item in my kit - both when drawing at home or while out and about sketching. The batteries enable the eraser to be spun very fast making erasure a simple and painless operation. If the non-pvc eraser picks up colour, use of the eraser on a clean piece of paper quickly restores the end to pristine condition. The erasers are soft and the act of erasing produces a lot of debris and a drafting brush or household paint brush are useful for removing all evidence of debris before picking up another pencil. I always know when the batteries need replacing as the speed of erasure slows down. Replacing erasers and batteries is easy peasy compared to some. I usually pull the eraser out and then use the other end before discarding and replacing. The body comes apart and puts back together really easily when you need to replace the batteries. The whole set-up is also amazingly cheap. Consequently whenever I see them in the shops (I can usually find them in Rymans) I always buy a bunch of them - one for every pencil case plus one for every backpack plus spares to lose / file away and forget where you've put them etc etc. It saves me panicking every time I can't find mine! 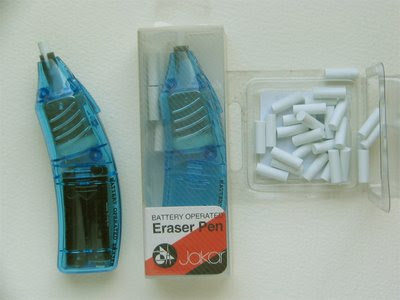 Technical Details: Jakar battery powered eraser pen - requires 2 x 1.5V AAA batteries. Available in Four Colours (blue, pink, yellow and green). Comes with 5 non-PVC erasers. Packs of 30 erasers also available. Summary: A very cheap and very effective battery powered eraser pen. Facilitates drawing through erasure. Suppliers:For those not familiar with Jakar, Jakar International has been the exclusive UK distributors of Caran d'Ache products since 1960. Jakar do not sell direct to the public, the company is a distributor which contracts with multiples, wholesalers, retailers, mail order companies and educational suppliers throughout the UK and Ireland. Artifolk has supplies of this eraser pen for £2.49 and also has supplies of the replacement erasers for 50p. Amazon UK can supply the Jakar battery Operated Eraser Pen (Assorted Colours) 5370-B for £1.50. It comes with 5 replacement erasers but you really also need to buy the pack of 30 Jakar Non-PVC Eraser Refills - which will set you back all of 60p! Time for an update and feedback on the poll about Which is your favourite make of artist grade coloured pencil? which has been running on my Coloured Pencils - Resources for Artists website for quite some time. This is especially relevant to those people who haven't seen it before. However it also seemed a good idea to pause and take stock as the poll recently topped 500 responses. The poll now comprises 509 votes. Overall the pattern has been pretty steady for a long time now with Faber Castell Polychromos and Sanford Prismacolor neck and neck and fighting it out for first place. Sanford Prismacolor are currently very slightly ahead of Faber Castell Polychromos in terms of which pencil is the favourite brand. To date, these two brands have attracted 29.9% and 29.1% of the votes respectively - which means that there is an even split between wax and oil based pencils with these two being the leading pencils for each constituent. Derwent Artists - this is a long established brand which I have grown to like a lot - although I'm careful which colours I use. It's moved up to 3rd place with 10.4% of the vote from 5th place (8.5%). Caran d'Ache Pablo now comes 4th with 9.4% - up from 6th (7.3%). I expected this brand to rise as the new Luminance lightfast range got off the ground despite the fact that pricing suggested this might take some time. It would be good to split out the two brands from the same manufacturer to see how they both do individually. 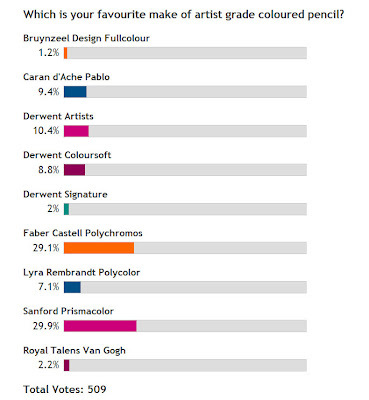 Derwent Coloursoft (positioned to replace the very popular Karisma pencil) did very well initially and came 3rd last July with 11.3% of the vote. However since then it's dropped to 5th place with 8.8% of the vote. Lyra Rembrandt Polycolor was in 4th place last July with 9% but has now dropped to 6th place with 7.1%. This is also an oil based pencil like the Polychromos and the two work extremely well together. It's a brand which I've used for a very long time and always finds a home in my pencil tubs and it also does pretty well on the lightfastness tests. Talens Van Gogh pencils have attracted few votes - but show a slight deterioration from 2.8% to 2.2%. I'm surprised by this as these are excellent pencils with the bonus of also being lighfast. (Talens and Derwent were the two manufacturers who developed lightfast pencils first). I'm pretty certain this is due to the availability of this brand in open stock - it's not easy to find. Both Bruynzeel Design Fullcolour and Derwent Signature have attracted very few votes. It's very difficult to find any information about the former on the web and Derwent announced some time ago that the latter brand was being discontinued. The problem with the current poll is that it reflects history. People who voted back at the beginning may have expanded the range of pencils they use and consequently changed their minds about which ones they like the best. I'm toying with the idea of introducing another poll which will be annual and have a cut-off date. This would enable us to see the shifts in preferences over time and indicate trends. Reviews of brands of coloured pencils - and time for some collaboration! I'm also going to start reviewing the individual brands of coloured pencils in the near future. I'd be interested in your comments as to what criteria should be used to assess coloured pencils and whether or not you'd like to contribute a review as well. If you'd like to take part just leave a comment below. Note: See also Making a Mark: Which is your favourite make of artist grade coloured pencil? 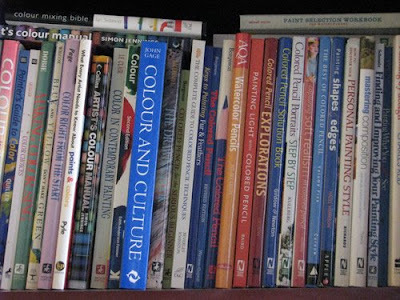 This is an update on the progress of my poll on Coloured Pencils - Resources for Artists as at the end of July 2008. Synopsis: A coloured pencil art instruction book providing a compendium of helpful hints and tips. Its aim is to help artists develop a critical eye for designing, reviewing and improving their own work. Highlights a range of essential checks that can be made for different types of subject matter. Based on the format of written critiques that Ann has been delivering via her e-magazine for the last 9 years. Suitable for: "Improvers" interested in improving they way the way they create, fix and refine their coloured pencil artwork. Artists who aspire to realism. Summary: a useful purchase for those looking to improve their work. It provides one place where you can find all Ann's critique techniques, hints and tips. For people unfamilar with Ann's structured critique approach, there's a lot of solid content which is useful to read and absorb. The book is let down by some design weaknesses. 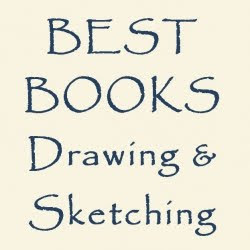 Most coloured pencil artists will know Ann Kullberg and/or have one or the other or both of her two books on drawing with coloured pencils Colored Pencil Portraits (1999) and Capturing Soft Realism in Colored Pencil (2002). I regard them as art instruction standards. Consequently any new book by Ann Kullberg has got to be worth taking a look at. You might also like to read A "Making A Mark" interview with Ann Kullberg which provides more insight into Ann and her long love affair with coloured pencils. 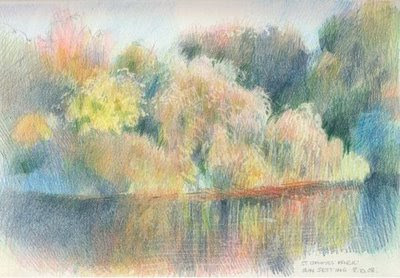 Colored Pencil Secrets for Success: How to Critique and Improve Your Paintings will be published in May 2009. I was sent a review copy so you can get my perspective on what the book is about and how well it delivers what Ann has set out to do in advance of publication! I think there are some weaknesses in this book but I rather suspect that these relate to the design and publishing aspect rather than what Ann set out to do. This is based on the fact that I was a subscriber to Ann's magazine for some time and I know the way her critiques are normally presented and what her target audience is used to. Getting started - My comments about this section are based on the notion that this is essentially a book for improvers - people who have learned the basics and now want to get to grips with how they can remedy mistakes and improve their work. This section covers basic tools and techniques and is possibly the weakest section of the book. 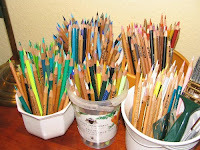 Information about coloured pencils, paper, tools and techniques to use is provided in summary form. The text is not dense and there's a lot of 'desktop' on show. (it is for example a marked contrast to Alyona's new book which I reviewed last week which provides a surfeit of detail). This book isn't aiming to be an introduction to coloured pencils and, in theory, the level of detail provided is probably fine given the nature of its focus. Those wanting more detail would do much better to look elsewhere. However I do query whether it's necessary at all. 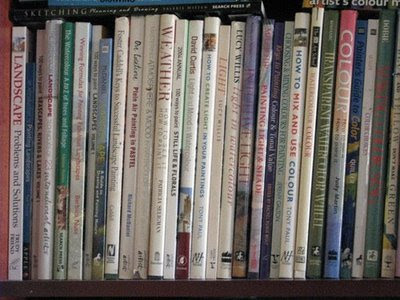 I also wonder why publishers always seem to insist on having a basic and introductory materials/techniques section up front in a book which is going to be bought by artists who have got beyond first base. Surely those pages could be put to better use? If there is a need for a refresher about basics I think it could have been delivered in a better way. Reference Photos - Many artists using coloured pencils work from reference photographs but "working from photographs" is a topic which hasn't always been covered well in the past. This section looks at how to take and use reference photos and what you can do with your computer to improve them. Ann tackles all the right topics, but keeps it simple and provides lots of very useful messages and tips for creating better resource material. I like the fact that it assumed that the person with the camera is operating something simple, straightforward and automatic and that this doesn't become a lesson in owning a camera! Instead it's a lesson in how to look for light, how to point the camera, what adjustments to make and how many pictures to take. Ann reduces her tips down to very simple sentences such as "Take a million shots" and "Don't take a picture, tell a story" and then explains them. She also includes a useful checklist. Critiques - The Critique section is the main substance of the book and those who know Ann's work well will know what to expect. Which basically means that the vast majority of the artwork is produced by artists other than Ann. They're all of a different standard too which I thought was very helpful. Seeing other people's work gives you a much better appreciation of the stages of improvement. Each of the critiques follows a similar format. You see a reference photo and the drawing completed by the artist. Ann provides a brief about the artist, says what her first impressions are and then highlghts what works and the areas which need a helping hand. The tips in this critique section are all "Hints" in a "post-it note" format! The great bit about Ann's critiques is that she explains why different aspects work (eg teeth which are not bright white and have been drawn as a group rather than as individual teeth) as well as explaining what's not quite right and how to improve it. She also takes the image and demonstrates how it can be improved using digital technology. As I indicated earlier what improvers need is a catalogue of helpful hints. That, in effect, is what the critiques deliver. However the hints are structured and made more accessible through being oriented around one image at a time. I like the way she delivers them - punchy headline in capitals and then generally between 50-70 words to describe each point. It's succinct and it makes learning the basics much easier. In design terms I also noticed that these points were easy to read as they're on a pale neutral background. The book highlights a technique which I will always associate with Ann. That of drawing virtual lines on the photo reference and an image of the drawing to see the relative size and relationships of different features more clearly and how well this has been replicated in the coloured pencil drawing. Again and again this technique delivers the message very fast. In fact I'd go so far as to say if you're interested in portraiture and do not currently get Ann's e-magazine but are in need help with proportions then buying this book for that one technique is money well spent. Many of the techniques are ones which do get discussed on CP internet forums again and again. However, the advantage of this book and Ann's approach is that you have a professional tutor showing you how to use them properly again and again and again. It's essentially a compendium of most of the helpful hints and tips that you need to learn to produce work of a high standard. Incidentally it was a pleasure to see that the artists who contributed work to the book came from a wide cross-section in terms of backgrounds and locations where they lived. Ann finishes each section with a small showcase of work by more experienced artists - and discusses why their work is good. As has always been the case, it's sometimes easiest to learn by understanding more about how good work is produced and what decisions were made in bringing it to fruition. The book finishes with a useful summary of the main things to watch out for and to work on. Presentation - The design and presentation of the book has both strengths and flaws. North Light Books have started to produce a number of art instruction books in hardback with a covered spiral binding the pages. This is an excellent approach which allows a book to lie flat - especially important for art instruction books. A lot of the artwork is also shown at near life size which highlights the texture of coloured pencil on paper which can often be lost when an image is seen in a reduced format. Thankfully I didn't see any at larger than life size which I have seen in other books of late and which I personally think is a great mistake. The 'design' for the book gives the impression of a wooden desktop with reference photos, artwork in progress and instruction notes (on pages of lined paper) lying on top. Some of the text (eg the Introduction by Ann and introduction to each artist in the critiques section) is then provided in a small handwriting font. I didn't find this at all easy to read. Nor did I find the more conventional font on a wooden desktop background easy to read either. Generally I had the impression of a design team which had become overly design oriented and a bit 'gimmicky' and had forgotten the dictat of 'form follows function'. I'm sure it all looked great if you have young eyes but I do wonder if they checked it out first with the potential target audience - a lot of whom are middle aged ladies who wear glasses and read in the evening! In conclusion - I think this is a book which will prove to be a useful purchase for those looking to improve their work and who like realism. For those who are familiar with Ann's critique approach and techniques it provides one place where you can find all her techniques, hints and tips a summary. For those who have not come across her structured critique approach before there's am awful lot of solid content which is useful to read and absorb. The major weakness lies with the design used for the content - aspects of which render the content less accessible than I suspect most readers will like. Synopsis: This is a superior paperback catalogue for the exhibition of the same name (Bruegel to Rubens - Masters of Flemish Painting). Functions effectively as a catalogue for the paintings in the exhibition. The text prefacing each section and providing context for this period of painting is dense and leans towards the academic rather than the accessible. Suitable for: People interested in learning more about a great period in Flemish painting. Includes 156 colour illustrations, 8 maps and a timeline. the sections would benefit from an overview of key figures, events and important facts about the period as it relates to art and artists. This is a confusing time in history and there needs to be a simple version. This review accompanies the Exhibition review: From Bruegel to Rubens - Masters of Flemish Painting over on Making A Mark. Accompanies the exhibition opening at The Queen’s Gallery, The Palace of Holyroodhouse in September 2007 and at The Queen’s Gallery, Buckingham Palace in October 2008. It is said that much of the greatest art is produced during periods of strife. In the mid-16th century, the Netherlands – the United Provinces in the north (modern Holland) and the Spanish-ruled south (modern Belgium) – was the most sophisticated society in Europe, but its learning and luxury industries were all but annihilated by the so-called Dutch Revolt and by the Eighty Years War that followed (1568-1648). Two-thirds of the works discussed here were painted during this turbulent period, including Pieter Bruegel’s Massacre of the Innocents of 1567. Other highlights include works by his son Jan Brueghel, while the Twelve Year’s Truce (1609-21) is celebrated by a group of landscapes (including three by Rubens) depicting the blessings of peace and the fertility of the region. During the Renaissance the Low Countries attained a flawless technique of painting and the highest standards of craftsmanship. This tradition survived during even the worst years of the war. Everyone is familiar with the Golden Age of Dutch Art; this is an opportunity to explore its no less glorious Flemish counterpart. Each of the paintings in the exhibition receives a double page spread in the catalogue. A reproduction of the painting is on one page with the text accompanying it on the facing page. While using the catalogue in the exhibition I found it very easy to use in relation to specific paintings. There is also a pleasing hierarchy between the detailed label next to each painting with the summary overview, the verbal explanation for certain paintings on the audio guide and the more detailed entry in the catalogue. They were all linked but different. The text explains about artist and painting which means that we get an appropriate amount of background information about the lesser known artists who can often get less attention in some catalogues. Important pieces have more space devoted to them and sections of paintings are also 'exploded' out of the image so that we can see the level of detail and quality of the finish at a macro level or understand the nature of what has happened to the painting - as with the amendments made to the Massacre of the Innocents by Pieter Bruegel to eliminate the pictures of the children. Each of the sections opens with an essay about what was happening during the period - with images of maps and key individuals as appropriate. Whether reading these in the exhibition or afterwards, I'd have really liked to see a summary somewhere which provided a bullet point overview of the key points relating to each period. As it is, one has to sit down and read each section in detail to arrive at the key points - which I'm afraid I don't tend to do in exhibitions! There's a timeline of people and events at the end of the catalogue. This provides a summary overview of the historical context for the paintings in terms of major and relevant historical events and who was ruling the House of Habsburg and the Holy Roman Empire as well as Spain, the Netherlands, the Dutch Republic and England. However what it does not do is link the rulers and events to the major pieces of art in the exhibition and the Flemish artists. I think that was a mistake since the purpose of a timeline in a catalogue like this is to provide context for the artist and the art! This review has been based on using the catalogue in the exhibition and a review again when I got it home. I'll update this book review once I've finished reading all the text explaining the history of context as well as the art. Desmond Shawe-Taylor is Surveyor of The Queen’s Pictures and was formerly Director of Dulwich Picture Gallery. Jennifer Scott is Loans Officer and Assistant Curator (Paintings), worked at National Museums Liverpool and the National Gallery and joined the Royal Collection in 2004. She lectures regularly on paintings in the Royal Collection. One of the the things I'm going to do once this blog has got off the ground is highlight some of the other good blogs which are also doing reviews of art books and/or art products. However Teoh Yi Chie of Parka Blogs has got there first and done a review of this blog in Making a Mark Reviews! For those who'd like to know more about Parka Blogs, as Teoh Yi Chie says his speciality is books relating to art in comics, animation and movies. I've been keeping an eye on it a while now and they're good reviews! This blog is going to have very specific blogrolls for book reviews and product reviews in the side column. Synopsis: A coloured pencil art instruction book. It details and demonstrates techniques for rendering different textures and using solvents for painting with coloured pencils. Excellent production values - strong paperback with vivid colour reproduction. All artwork is produced by Alyona making for a uniform (and strong) style throughout which some will love while others may not be fans. However the lessons apply to a wider range of styles and subject matter and the use of images from other artists would have helped to persuade on this point. 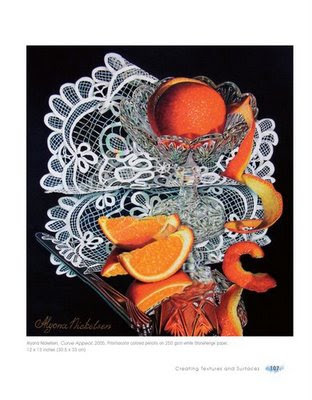 I first saw Alyona Nickelsen’s coloured pencil artwork on the Wet Canvas Coloured Pencils Forum. She had achieved an intensity and depth of colour which was quite unlike anything else I’d seen. There had to be a secret behind it and we all wanted to know what it was! 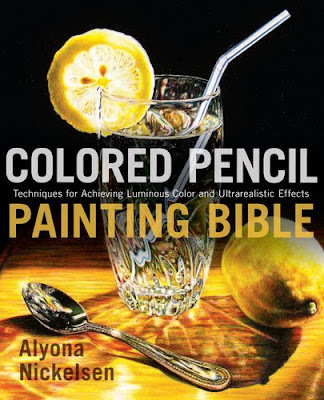 The subtitle of the Coloured Pencil Painting Bible is ‘techniques for achieving luminous colour and ultrarealistic effects’ which is a very succinct way of describing the art in the book. Alyona makes extensive use of solvents for dissolving coloured pencils and speeding up the saturation of colour required for base layers before developing the detail of surfaces in her still life paintings. In my view this book is going to be of most interest to people who like to produce realistic art with saturated colours. However, using solvent to speed up the drawing process and enhance saturation is a technique which anybody can use whatever your style of drawing. For example I like to use it to get a solid base coat down so that I can scribble on top of it! I’m an inveterate ‘flicker’ – by which I mean I always start looking at a new book by flicking through it to get a sense of the whole and to see what catches my eye. I also always flick from the back and it came as a surprise to me when I immediately stopped at the very first section I came to! At the end of the book there is a detailed appendix of all the various brands of artists’ coloured pencils. Each lists pencils by pencil number, name and lightfastness rating – as designated by the manufacturer. It also identifies the approach used by each manufacturer towards testing and describing lightfastness (and not all comply as yet with the ASTM standard). This is the very first time I’ve seen this in any coloured pencil book. CPSA produce a lightfastness workbook but you need to join the CPSA to be able to buy that which can make it a very expensive purchase! It’s good to see a coloured pencil artist/author giving such prominence to lightfastness in an instruction book. Reviewing the materials and basic set up - As in many art instruction books, the first section of this book is devoted to a review of materials and approaches to working with coloured pencil. I’ve always felt a particular affinity with Watson Guptill books as they almost always set very high standards for the quality of information they provide about art materials - and this one is no exception. Alyona provides a very thorough overview of paper, pencils and solvents. She has a lot of very useful information about best to store paper to avoid deterioration, highlights the composition (wax or oil) of all the major brands of coloured pencils and reviews in detail the range of solvents on the market. I’ve not seen the latter done in depth before and it’s most useful. She also provides an extremely comprehensive summary of a range of useful tools for working with coloured pencils. I thought I knew all of these but Alyona managed to surprise me with one or two! Laying down a solid foundation - Next up is an overview of issues relating to composition and design and why they’re important to the development of any artwork plus highlights some useful tips. As I've commented in book reviews in the past this is an aspect which is often 'under-cooked' in a number of instruction books. This one is more useful than most. I especially liked her explanation of the rules of composition as being akin to learning how to cook using a recipe book. You have to know how the ingredients work together before you can start adding and subtracting basic ingredients and start to break the rules and create your own unique style. Alyona is somebody who has had to learn a lot of new things in her life (read my interview with her on Making Mark today) and it strikes me that this is probably characteristic of her approach to life in general. I rather think that for the processes for making art which root explanations in cooking and family life are going to sit well with a an awful lot of the potential readers of this book. Here’s an example she's used in relation to discussing harmonies between textures. Images are annotated in this section, but I found it a bit difficult to follow the links between areas A, B, C and D in the image and the comments about areas A, B, C and D in the text. From a personal perspective I'd have found an 'exploded' annotated version of an example image much more useful if the relevant sat right alongside the area being discussed. The content is all there - it's just not presented in a way which is as accessible as it could be. At least part of Alyona's success is due to her understanding of colour, how it works and how to use colour contrasts to help make a painting stand out from the crowd. In particular, she has an excellent understanding of how the colour of a background can enhance the subject. Design and composition is is followed up by a section which discussions of colour, values and tonality and light. I particularly liked some of her tricks for working through issues to do with colour, value and colour mixing - the development of the colour chips, how to locate colours on the colour wheel, the use of coloured acetates and the use of digital technology to help you both visualise colour relationships and progressions and also to help you keep track of all the various colours and how they relate to one another. There are some very useful ideas which will be of interest to even experienced coloured pencil artists. There are also some very useful fact based tips sections which I can imagine will become well thumbed over time. Overall this section of the book provides a more in-depth review of basics than most while at the same time highlighting some very useful tips. Mastering essential techniques - This section moves on to the different ways of getting coloured pencils down on paper. Other books pay more attention to conventional pencil techniques while this book focuses more on other techniques such as fusing colours using solvents, creating patterns in the paper prior to the application of pencils, using erasure to draw and create different marks, powder brushing and sgraffito rendering. It also tackles the use of photographs and all the various problems that photographs present in terms eg of misrepresenting values and altering colours and how these need to be addressed. There are also detailed explanations of various methods for transferring images to the drawing paper - this includes the photoshop method but excludes the use of projectors! I like the fact that Alyona clearly highlights the pros and cons of each method. Creating textures and surfaces - There are a large number of detailed and well presented step by step demonstrations of how to render different surfaces If there was one criticism I'd make it's that I'd have liked to have seen images of Alyona actually applying an OMS wash using a brush when developing her artwork. There's one very small image of her using a cotton bud and that's it. We have the before and the after without the middle. Practicing with simple still lifes - The fifth chapter is devoted to a series of twelve exercises about how to render different types of surfaces - employing the techniques explained earlier. Also included are some traditional "take xyz pencil and apply...." exercises which can be followed by beginners wanting to try and emulate her work. In conclusion - This book is highly relevant to any coloured pencil artist who likes realism, still life and flowers. It contains an awful lot of really useful material explaining how coloured pencils can be used to produce artwork with impact. Essentially this is a techniques and tips book. Personally I would have liked to see just a bit more variation in demonstrating how those techniques apply to a range of subjects and styles - possibly through the use of images from other artists. 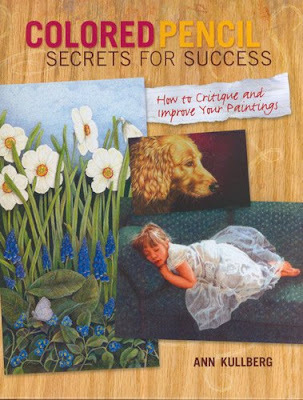 Next week I’ll be reviewing Ann Kullberg’s new book – Colored Pencil Secrets for Success: How to Critique and Improve Your Paintings - which is due to be published next month. It arrived yesterday and I've already had a quick skim and I'm looking forward to writing my next book review. Note: If anybody would like to provide me with feedback on the summary template at the top please free to let me know your views. 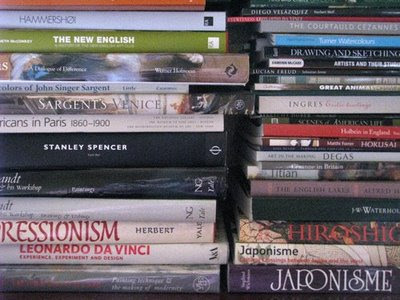 It's intended to provide a rapid scan overview to help people determine whether they want to read further. 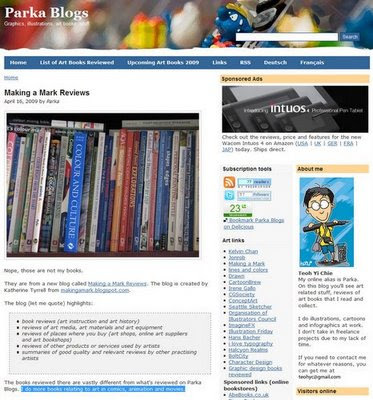 An introduction to "Making a Mark reviews......"
This is a new consumer oriented blog which will review quality and value in art books, art supplies and other products and services used by artists. This new blog is a spin-off from my very popular blog Making a Mark. In future this blog - Making a Mark reviews...... will become the home of all reviews oriented towards the artist as a consumer. 'Making a Mark' (the blog) will focus more being an artist and making art. Specifically it will cover my my art, art projects, notable artists, interviews with artists, art exhibitions, art careers and aspects related to the business of being an artist - plus techie bits about the web and blogging from time to time. 'Making a Mark reviews...... ' will be more consumer-oriented. It will deal with the commercial aspects of art in terms of books and products for artists and items that we as artists spend money on. This enables me to do more reviews without squeezing out the art-making aspects which are the essential focus of Making A Mark. As anybody who has visited my website Making A Mark (www.makingamark.co.uk) will know I have three passions - drawing, writing and sharing information. This new blog will also link to and support the makeover and the major development of the 'sharing' part of that website to create a new digest of information which is focused around specific topics. However, due to the major hiatus I've been experiencing recently with computers misbehaving and dying, I'm very behind with this makeover. However I will start to unveil new pages in the near future and the first one - no surprises here(!) - will be about coloured pencils. Using this blog I want to try and identify what is good quality and what is good value in art supplies, art books and services relevant to artists. In doing so I'll also be trying to identify the places where we should be spending our cash - because they provide a cost-effective combination of competitive prices, excellent product knowledge and amazing customer service. Where possible I'll also be reviewing other services that we as spend money on as artists (eg websites, software etc). Irrespective of whether you are on a tight budget or have no financial worries, as artists we all tend to appreciate good quality - when we know what that is - and absolutely hate wasting money. I also know that very many artists love sharing their experiences about art materials and art books and hopefully this blog will become another place where you can do that. I've always been absolutely passionate about consumers getting a fair deal. People should be able to get good quality products for a reasonable price. I spent a large part of my career focused on the achievement of cost-effectiveness - otherwise known as value for money. I love finding out about new materials, aids and books which aim to help us out as artists. I'm never averse to trying something new - and I'm happy to share what I find out - hopefully in co-operation with you all as readers. I hate seeing people getting ripped off by poor quality books, art materials which are not fit for purpose, or OTT product claims. I have a very long track record of being a very picky consumer with a pronounced tendency to ask a lot of questions. I read all the labels, the product descriptions, every review on the Internet and anything else I can find before I buy big ticket items! I'm also an inveterate researcher who aims to check out product claims and find out all I can - including the views of other consumers. There's been no stopping me since I've found out that there's absolutely no need to stay in the dark. If you ask questions producers and retailers often answer and some are very helpful! I want to help you have a voice. Whenever I've highlighted and reviewed a product on my other blog, I've found that the comments it received added real value in terms of the knowledge and experience of you the consumer. I'd like to create opportunities for more of that! Given that this blog is going to be talking about commercial products, I decided it would probably be a good idea to create a set of ground rules for how it works. Basically it's all about trying to be both fair and achieve a balanced perspective. The basic principles of the approach which will be adopted by this blog are as follows. These will be updated as and when required. I'm on the side of the consumer. My principal motivation is finding out whether you and I are getting a good deal and products which do what they claim. All reviews will be honest AND fair to both producer and consumer. They will highlight both good points and aspects which might make you think again. authors, publishers, manufacturers and producers are doing the best they can do - even if they don't always get it right. producers want to hear about what consumers think about their products because this means that they can refine and improve what they have to offer - and sell more product! accepting ARCSs/product samples does not impair my judgement or my ability to write a fair review! Besides which I still have quite a few resources of my own in terms of art materials and a few hundred art books already in back catalogues! if I'm sent a book to read or an art product to try I'm under no obligation to write a review about it on this blog. Anybody who acts as a guest reviewer on this blog will maintain the standards set for this blog. In a separate post which follows this, I'm going to be setting out a statement of how the comments policy will work. This will also be referenced in the side column for all new readers. Last week when previewing the introduction of this blog I wrote about some of the ways that we can use this blog to channel the 'wisdom of crowds'. Here are just some of the ways that I hope you can get involved with the development of both this blog and its reviews. avoid the use of weasel words. asking you for suggestions of useful books, products, suppliers that you've found. invite experienced artists to offer their views on their favourite products. 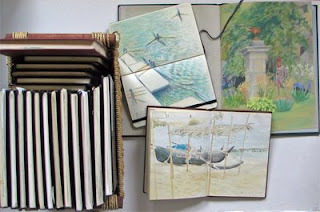 The advantage of this blog is that I can also create a set of tags which enable you to identify quickly and easily the type of content you're interested in and what has been said to date - whether it's soft pastels, art pens or art instructions books. If you'd like to get involved please leave a comment below. If you'd like to let me know that you've written a product review on your own blog leave a comment on this post. All comments are moderated so I'll always know when you've left a comment. Links to all the blog reviews will be added to the information, advice and reviews which can be found in my "Resources for Artists" sites.